Setting up a small office or home network used to be a fairly complicated task. Aside from the technical knowledge needed, there was expensive equipment to buy and specialized tools for wiring. That's all changed - the necessary equipment is cheap and readily available and it's all very easy to configure. If you have unusual needs or a mix of older equipment, parts of this still can be a bit tricky, but for most people, adding a second or third computer is as easy as plugging it in to the same place as their original computer is attached. That's really all that you need to do - it should just work automatically in most cases. Wireless setups can perhaps be a little more frustrating, but even then it is often as easy as just turning on the new machine. If there are any snags at all, these are often in the area of sharing files - getting one computer to "see" another computer on the network. That can still require a small amount of geekery. Sharing printers can also sometimes be troublesome. I'm going to assume that you are reading this because you are having trouble. You've brought in a new computer (or you are about to) and you want it to see files on the old or vice versa or you want to share a printer. These are common home networking problems. I sometimes get calls from people who want me to come add a new computer to their network. Often this is a homeowner who has tired of sharing one computer with their spouse so they have bought a second machine and want me to come "set it up". I tell them to just plug it in and call me if they have a problem. Quite often, they never call because, as I said above, most of the time this stuff will just work out of the box. If not, a little bit of knowledge can go a long way. That's what this article covers - the basic knowledge that might help you get by some silly little thing that kept it from working effortlessly. Unfortunately, I probably can't anticipate every single problem you might have. I also can't go into great detail in every area or this will turn into an encyclopedia. Instead, I'll try to give a ten thousand foot view of the issue and provide links and suggestions for further investigation. This is where you should start. Maybe eventually you want this new machine to be wireless, and I will get to that, but let's first establish that the machine can connect to the Internet with a hard wired connection. If you want wireless and are adventurous, you can jump ahead to the wireless section, but if you have any trouble, come back here and we'll try this first. We will get to the wireless, I promise. I'm assuming that you have one machine already working and accessing the Internet. If that's not true, please see my "A non-technical guide to understanding and fixing TCP/IP problems on a network". So - where do you plug the new machine in? 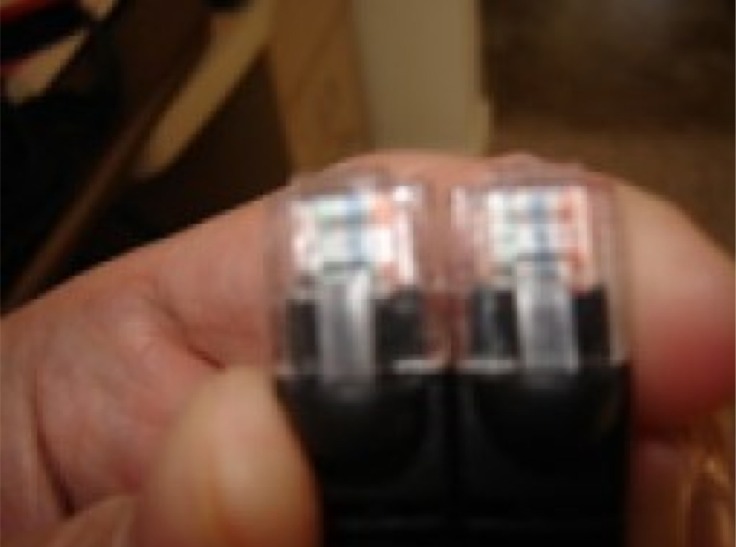 If you have a high speed Internet connection, you may have a box you got from your ISP that has multiple places to plug in wires. It might look like the unit below, which happens to be my Verizon router. By the way, you won't need "drivers" for your router. Most routers are configured by using your browser. Some may have a setup CD that makes that easier, but there will not be any drivers involved. You'll notice that has three ethernet wires connected to it. One of them (the gray wire) is the connection to the greater world - the Internet. The other two are connections to things inside my home. There is room for two more network devices to plug in - the yellow plugs marked 3 and 4. I could plug a new computer or TCP/IP printer into either of those places. The only one that is special is the gray one that connects to the Internet. Other than that gray wire, It doesn't matter which computer is plugged into which connection - I could switch them and put the red wire into the port marked "4" and everything would continue to work. That "it doesn't matter" isn't always true. Larger businesses may use managed switches and it might matter where you plug in. That is very unlikely at a home or small office, though. I'm about to make some very broad assumptions here. I'm assuming that you have a working Internet computer now, and I'm also assuming that it is connected to a router that is functioning as a DHCP server. I'm also assuming that the computer you are adding is new and that it will ask for a DHCP address. I'm assuming you do not have a managed switch. You don't need to understand what that means, just that it is a typical and expected configuration. What would I do if I had more than four things to plug in? In fact, I do have more than four things to plug in. To solve that problem, I bought a little 8 port 10/100 network switch. 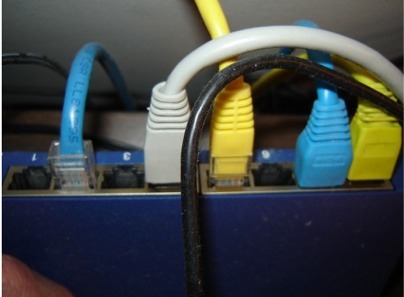 The blue wire from that Verizon router is one of the blue wires you see plugged into the switch. The other wires go to other computers and printers. This switch turns the four ports I have on the Verizon router into ten (it's not twelve because I need one port from each to connect these together). I need just one extra cable to expand the number of machines I can connect to that router. Cables are cheap - and you can get them in any length you need up to (approximately) 300 feet. By the way, if you run down to your local Staples or Best Buy or Radio Shack, you'll pay outrageous prices for cables. Buy them on-line cheaply and be ready when you need one! Switches are also inexpensive - I probably paid less than $30 for this one. You can get them with 4 or 5 ports, 8, 16 , even 32 ports and more. They can be 10/100 speed or 10/100/1000 (10 is the slowest, but it's still faster than many home internet connections). If you are buying a switch, you may as well buy the 10/100/1000 today even if your equipment is only 10/100. Anything you buy from now on will probably be gigabit capable (the "1000" of 10/100/100). You can chain switches together - I could run a wire from this switch to another switch to get even more ports. I might do that if I wanted to put another group of computers over on the other side of my office. You can't keep doing that forever - there are physical limits (that 100 meter/300 foot thing) that prevent you from chaining switch after switch after switch, but you can certainly chain several of these if you need to. There is one basic rule you have to follow: one wire from each switching device to the next. You can't have loops (well, you can, but you need very special kinds of switches for that). If I connected two wires from the Verizon router to that switch, that would be a loop and nothing would work. So go ahead and plug the new computer in wherever there is room. If there is not room, go buy a switch. Warning: do NOT buy another router. 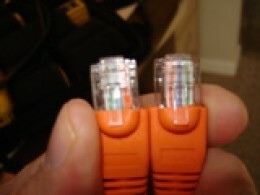 Like the Verizon unit shown above, routers often have built in switches. 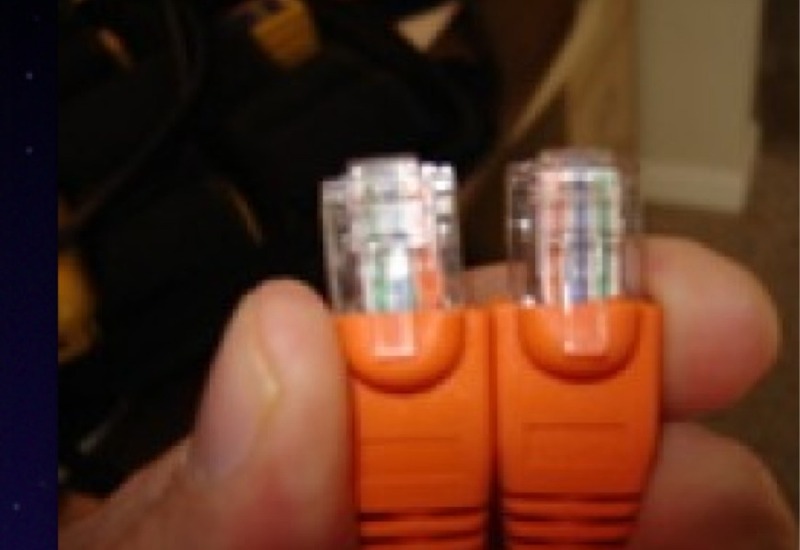 Connecting two routers together is possible, but in a home network, it is just going to mess things up. You want a switch. There used to be special ports on switches that you had to use if you were connecting to another switch as I've done here. They were sometimes called "uplink" ports and they'd usually be specially marked. Alternatively, you'd need to go buy a "crossover" cable. You almost never need a crossover cable today. Once in a while I'll see some odd piece of equipment that does need one, but the documentation is usually very clear and, because this is so unusual today, the device will usually come packed with the needed cable. 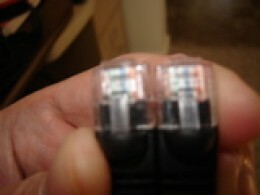 It's easy to tell if a cable is a crossover type: hold both ends as shown in these pictures. The cables need to be facing the same direction (both plastic tabs away from you or both facing you) and looking at the colors of the wires inside. If the colors match left to right, you have a straight through, "normal" cable. If they are reversed, it's a crossover cable. Oops: You only have a cable modem? 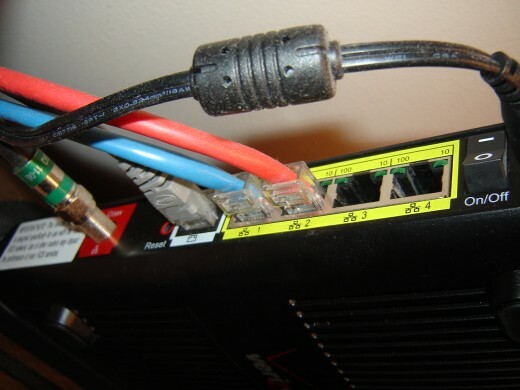 t's rare to see this nowadays, but I have seen many older cable Internet systems where there is no router and the computer is connected directly to the cable modem and has a public ip address. This is dangerous. That computer is directly exposed to the big bad Internet. It should be behind a NAT router and be using a private IP address. If the ip you saw from your computer did not begin with 192.168, 172.16 through 172.31 or 10, you are using a public address! If that is your situation, you need to go buy a router. It should not be particularly difficult to reconfigure your existing computer to go through the router. The router will be connected to the cable modem and will help protect your local computers. Cable companies usually provide routers today, fortunately. We'll talk about this more in the next section, but if your present router does not have wireless ability built in, you do NOT have to go buy a new router. You can, of course, but all you really need is what's called a Wireless Access Point (WAP). 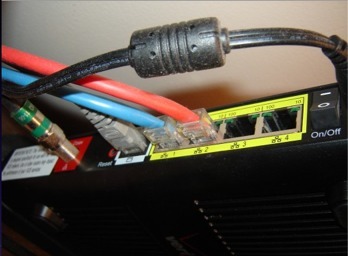 A WAP connects to your existing router with a cable and then it provides the wireless signal you want for the rest of the house. These usually come with very good instructions and are easy to set up. Oh, no, you still have dialup?? I'm sorry, that's really awful, isn't it? It's been a while since I have seen that, but it is possible to share a dial-up connection. I'm not going to cover that here, but you can Google for "share dial up connection" if you need to. If this is working, the new machine can now connect to the Internet. If not, please go see the "A non-technical guide to understanding and fixing TCP/IP problems on a network" that I mentioned way up at the top. In part two, we'll look at a wireless setup and in part three we'll cover sharing files and printers and more fun stuff. It's always tempting with articles such as this to say "but what about..." or "you need to cover..." If you aren't careful you then end up with something far longer than anticipated which loses its introductory nature and in all probability doesn't get read by the people who actually need it. However, there is one thing I will always suggest from the very outset - label all cables. Different colour cables certainly help but there are only so many colours and inevitably at some point there will be some repetition. When that happens it doesn't need many cables at all before it becomes unclear what cable connects which device. Labelling cables with the devices they connect may seem obvious but in my experience they change over time. It is much better simply to uniquely number each cable (at both ends). It may seem unnecessary at the outset with only two or three cables but after five years and when several more devices have been added you'll be glad you did. Good idea, although home made taped labels disintegrate and fall off after some time. It's been a while since I have seen that, but it is possible to share a dial-up connection. At one time, 3Com had a product called a LAN modem, which allowed up to 25 (!) clients to share a dialup connection. I had a client that was on that arrangement for about a year before they became convinced that SDSL was much better (and T1 better still). Dunno if the LAN modem is still around, but if someone is relegated to dialup for Internet access, it would be possible to share the same connection -- assuming speed isn't important.